To achieve success with your medical school application, you need to start early and stay on top of the application process. 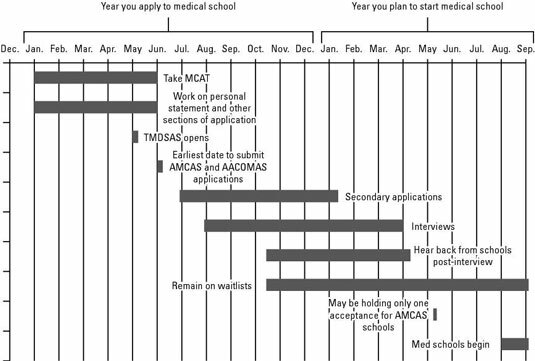 The timeline for applying to medical school begins in your junior year if you plan on entering medical school right after college, or the year after that if you are taking a gap year to improve your MCAT scores, GPA, or relevant experience. Your junior year is a busy one, but you should take care of as much as you can during the academic year so you’re ready to submit your application when the cycle opens (in May for TMDSAS and in June for AMCAS and AACOMAS schools). Early in your junior year, set up a meeting with your premedical advisor for guidance at the start of the semester and keep up your contact with him or her throughout the year. Determine which courses you still need to complete before the MCAT and prior to beginning medical school. Plan your class schedule for the remaining semesters. Assess your application portfolio for weaknesses. Address weaknesses by adding or continuing clinical, community service, leadership, and research activities. Meet with your prehealth advisor to find out whether your school offers a committee letter for recommendations and how to obtain one. In addition, find out what resources your advising office provides for application help. Begin considering possible sources of recommendations. You will need individual letters of recommendation (if your school doesn’t offer a committee letter) or to contribute to your committee letter per your school’s policy. Become familiar with the application process. Visit the websites for each of the primary application services you’re using to find out how each application works. Gather information about medical schools. The Medical School Admission Requirements (MSAR) Online database is an excellent resource. For information about DO schools, you can download the most recent Osteopathic Medical College Information Book. In addition, visit the sites for individual schools and attend open houses or information sessions. Register and study for the MCAT if you plan to take the test in January. Register online at least two months prior to your planned test date. Test-takers planning for a spring test date can also get a head start on test preparation by beginning to study for the MCAT in the early fall. As the second semester of your junior year gets underway, here are some things you should attend to. Consider taking the MCAT in January if you feel prepared; otherwise, register for and prepare for a spring test date. Continue clinical, community service, leadership, and research activities. Summer positions in clinical and research settings fill up quickly, so work on nailing down your plans for summer break well in advance. Begin writing your personal statement and descriptions of work and activities for primary applications. Develop a list of schools (to be finalized after MCAT scores are received). Request letters of recommendation from faculty, physicians, and other evaluators individually or obtain a committee letter per your undergraduate institution’s protocol. Arrange for summer plans, such as working in a clinical or research setting or taking classes. Continue to prepare for the MCAT. Take the MCAT by the end of May if at all possible (and no later than early summer unless you absolutely need more study time in order to achieve a good score) so that you have scores submitted to your schools of choice early in the cycle. Continue working on your personal statement and other areas of the primary application. Take the MCAT if you haven’t already done so. Begin submitting TMDSAS materials if you are interested in Texas medical schools. Primary applications and supporting materials (transcripts and letters of recommendation) may be submitted at this time. Start filling out AMCAS and AACOMAS applications. You can start filling in your applications for these services in order to be ready to hit “submit” in June after grades come out. AACOMAS doesn’t accept letters of recommendation. Letters should be sent directly to DO schools during the secondary application process. Submit AMCAS and AACOMAS applications. AMCAS and AACOMAS open in early June. Submit primary applications as early in the cycle as possible. Begin doing paid or volunteer summer work in a clinical, research, or community service setting and/or taking summer courses. Receive secondary applications. Aim to submit secondary applications within one week of receipt. Earliest schools begin extending interview invitations. You should schedule interviews as early as possible. Prepare for interviews, including purchasing interview attire. Retake the MCAT this month or in August if your initial score was low and you’ve had sufficient time to prepare again. Continue to receive and complete secondaries.TMDSAS and ACMAS Early Decision Program (EDP) deadline is August 1. AACOMAS schools EDP dates vary by individual school. Schedule or go to interviews. Many schools begin extending interview invitations by late August, and some schools begin conducting interviews at the end of August.